Brace yourself for a lively debate about legalized marijuana issues that will soon be dominating conversations in Encinitas. Every week at City Council, any member of the public may comment for up to three minutes on any matter. We, the elected officials, don’t engage in any back-and-forth or response because the item hasn’t been noticed to alert the public that we’ll be talking about it; we simply listen. There are a handful of speakers at most meetings, and occasionally we have none. But over the last several weeks, we’ve had a steadily increasing number of speakers talking to us about marijuana. Last week, there were almost 20 people on this topic. Most are strongly opposed to the city allowing stores to sell it, greenhouses to grow it, or industrial areas to manufacture marijuana products. They cite degradation of community character, safety and crime concerns, and fears of increased youth exposure to pot. There are also those in favor – some pro-agriculture, others focused on medical benefits, others who say it’s the new landscape and we need to adapt. 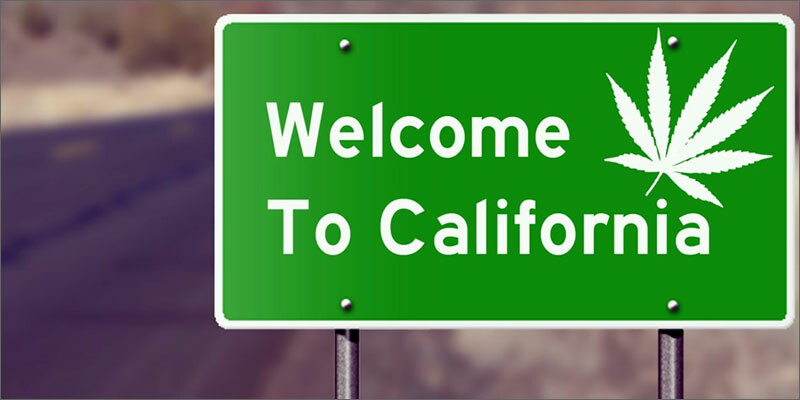 California voters passed Prop. 64 in the last election, which allows the sale and cultivation of recreational marijuana. Encinitas can enact regulations around marijuana businesses or prohibit them outright. But if we don’t act, the state can begin issuing licenses at the beginning of next year. Months ago, the City Council created the Prop. 64 – Adult Use of Marijuana Act Subcommittee, consisting of Councilmembers Tony Kranz and Joe Mosca. Their job is to recommend whether to allow marijuana to be grown in Encinitas (only in agriculturally zoned areas) or to reach some other conclusion. The subcommittee is expected to get back to the City Council before the end of the year, after its last meeting planned for mid-September. They have been taking public testimony and will continue to do so. This is the right forum in which to speak if this topic interests you. And this week the conversation got even more complicated because the city received notice of “An Intent to Circulate a Petition” regarding marijuana regulations. This petition aims to garner enough signatures to qualify a local initiative for the ballot. Here’s a San Diego Union-Tribune story on the petition drives planned for Encinitas and other nearby cities. If the Encinitas City Council enacted regulations around marijuana businesses, including opting to prohibit all marijuana business outright, the results of an election on this ballot measure would supersede our decision. So ultimately, the voters may well decide this issue. At least four marijuana dispensaries or shops that can sell marijuana and marijuana products. The language states, “Maximum of one retailer per 15,000 residents permitted, except City Council may authorize additional retailers.” A separation of 1,000 feet from sensitive uses such as daycare centers, schools or playgrounds required. Operating hours from 7 a.m. to 9 p.m. seven days a week, and a security guard on the premises. Commercial growing of marijuana could take place only on agriculturally zoned properties, inside a greenhouse or building, with no visibility from the street, no public access and no on-premises sales. Manufacturing and distributing marijuana products would be allowed. So, what do the people of Encinitas want? Interestingly, Encinitas voters rejected a 2014 ballot measure from the same group promoting this current measure – San Diego’s Association of Cannabis Professionals. Measure F failed, with 56% voting no. I recall there being very little organized opposition at that time, and it still didn’t pass. But in 2016, Encinitas residents passed Prop. 64 by the highest margin in the county, with 65% voting for legal recreational marijuana. The contrast in these two votes, just two years apart, leaves a murky picture. Are Encinitas residents’ views evolving? Do voters who supported legalizing recreational marijuana want marijuana stores in their own city? This is an emerging issue in Encinitas that I expect will reach a feverish pitch. I believe we’re seeing the beginning of a tsunami of strong opinion in this culture war. In the meantime, I’m waiting for our marijuana subcommittee’s recommendation after hearing lots of public testimony and investigating the issue in greater depth. And we’ll all wait to see if the proposed ballot measure gets the signatures it needs to get on the ballot. We’re in for a provocative and compelling saga, and I’ll keep you informed as events progress! 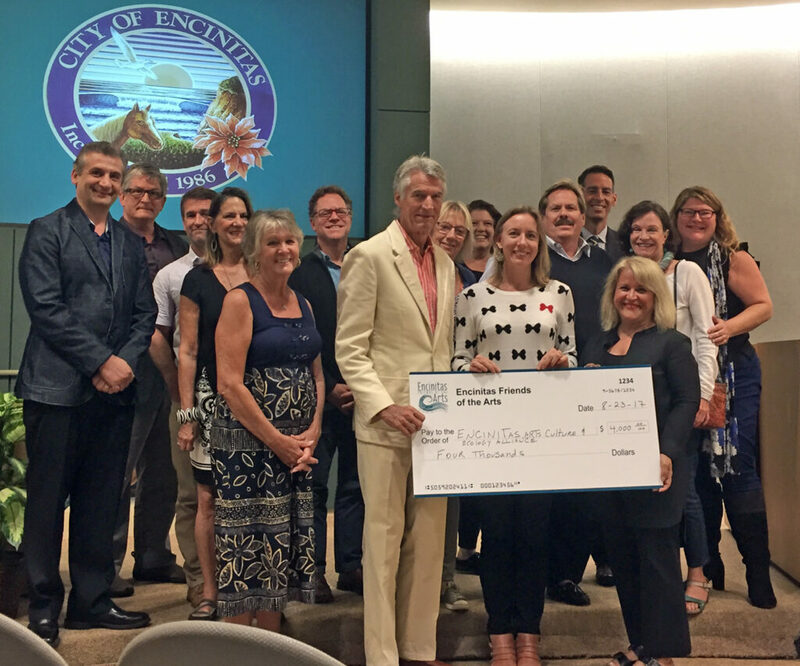 Encinitas Friends of the Arts presented the Encinitas Arts Culture and Ecology Alliance with a check for $4,000 at our City Council meeting last week to help support the great work taking place at Pacific View. Previous Post8/20/17: Beacon’s Beach Bluffs BindNext Post9/3/17: District elections, Beacon’s, Bikes, Marijuana, and a whole lot more!